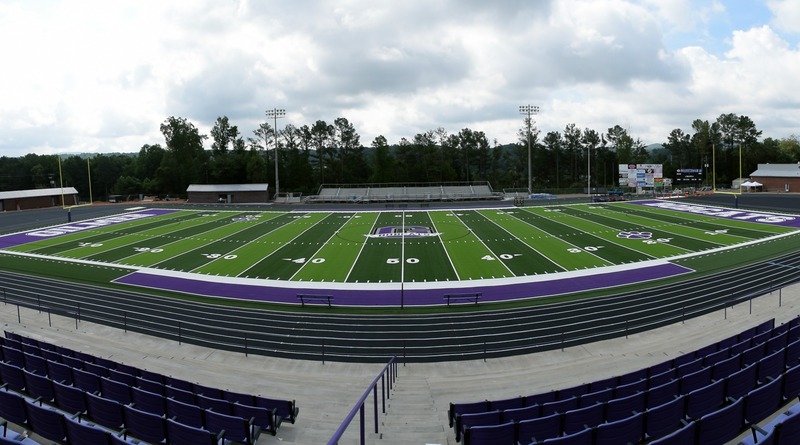 Gilmer High School in Ellijay, GA became the first school in the Southeast to play on the most advanced synthetic turf system available, the AstroTurf Golden Series. 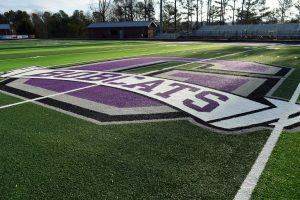 After much deliberation over what synthetic turf product would best suit their needs, the Bobcats nestled in the North Georgia Mountains, eliminated traditional infill turf systems in favor of high performance and safety. By selecting a high-density, short length fiber, pad and ZeoFill infill turf system, commonly referred to as DT32, Gilmer County embarked on their journey to revolutionize their field before graduation. With California leading the way in new synthetic turf technology. AstroTurf invested in a new alternative infill design for Los Angeles Recreation and Parks that has now been installed across the nation at high schools, municipalities and Division I fields. Driving the product was a desire to create consistency in safety utilizing a pad, a “no fly-out” infill system, and high durability with lots of fiber that had already been proven in the field over decades with lowering field temperatures. Simply stated by Jimmy Newsome of LA Recreation and Parks, “We had a table full of turf samples. After reviewing the products one by one and eliminating the ones that did not fit our needs, we had an empty table.” This drove the city to develop their own product alongside Astroturf. Since that moment, AstroTurf has installed over 4 million square feet nationally. Gilmer High School’s football stadium was a project awarded to Sports Turf Company, Inc. through a competitive proposal process. Construction began in February of 2015 working through North Georgia’s unpredictable winter weather. minimum of 60 inches an hour to drain successfully from the new synthetic turf field. Exterior field drainage was installed inside the track to ensure water wouldn’t travel back across the track surface. Golden Series DT32 all weather turf system utilizes slit film and nylon, which are the two workhorse’s of the industry. It is important to note that another industry first, Gilmer’s end zone lettering and football numbers were prefabbed in a climate controlled warehouse facility before the carpet even arrived for installation. A typical field has 398 inlays plus logos and end zone lettering. By cutting these with a robotic water jet, everyone is guaranteed to be the most crisp. Gilmer’s prefabbed field meant the most precise installation, no rain complications and the field was ready on time for graduation. The last step of field construction, 1.5 pounds of sand per square foot was incorporated into the synthetic turf system as a ballast before the ZeoFill was groomed into place. 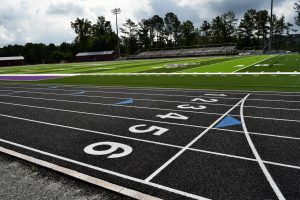 Sports Turf Company’s certified track builders evaluated Gilmer High School’s stadium and found widening the field to allow for a regulation soccer field would not eliminate a lane of the track based on where the home grand stands were built. The orientation was redesigned shifting the field towards space on the home side to best suit Gilmer High School’s needs and allow for a regulation soccer field. The entire field was enlarged, the distance between the measure lines for the track were changed, and the straightaways were shortened. The curves were made longer and wider to accommodate the new wider field and maintain 6 lanes on the track. Track construction began with installation of a 4-inch stone base and 3-inches of asphalt. A Sports Track ST-50 13 mm black latex track surface was installed and the track lined for GHSA competition. The Golden Series carpet replaces rubber infill with ZeoFill, a brand of Zeolite carefully sourced for its optimal purity and hardness. ZeoFill is a part of a group of organic minerals that are formed slowly over millions of years through crystallization in shallow marine basins. Not only is ZeoFill an all-natural mineral, it is able to absorb 81% of its weight in water and release it slowly to create an evapotranspiration effect, thereby cooling the field. In effect, ZeoFill by itself, can decrease the temperature of a synthetic field by 20-30 degrees. The turf in the Golden Series system, DT32 packs 80 ounces of fiber per yard into 1.25” tall pile, with each row spread apart only 3/16”. The increase in fiber density compared to conventional competition turf systems with only 36 ounces of fiber means it is twice as heavy as those traditional commodity systems and four times as dense, contributing to the system’s longevity and performance. 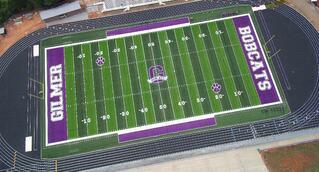 Gilmer’s field utilizes a “Brock” pad. These systems consist of small beads of polypropylene molded under pressure into a certain design. The Brock pad allows the system to maintain a low stable force reduction rating, called GMAX, throughout the life of the system, making it one of the safest systems on the market. It is also one of the best long-term investments with a pad that is guaranteed for two lifetimes of the field before it needs to be replaced. We spoke to both the athletic director for Gilmer High School, Terry Luck, and Principal, Carley Foley, about theirthoughts on the brand-new field.